Learning how to tell time is so much fun! 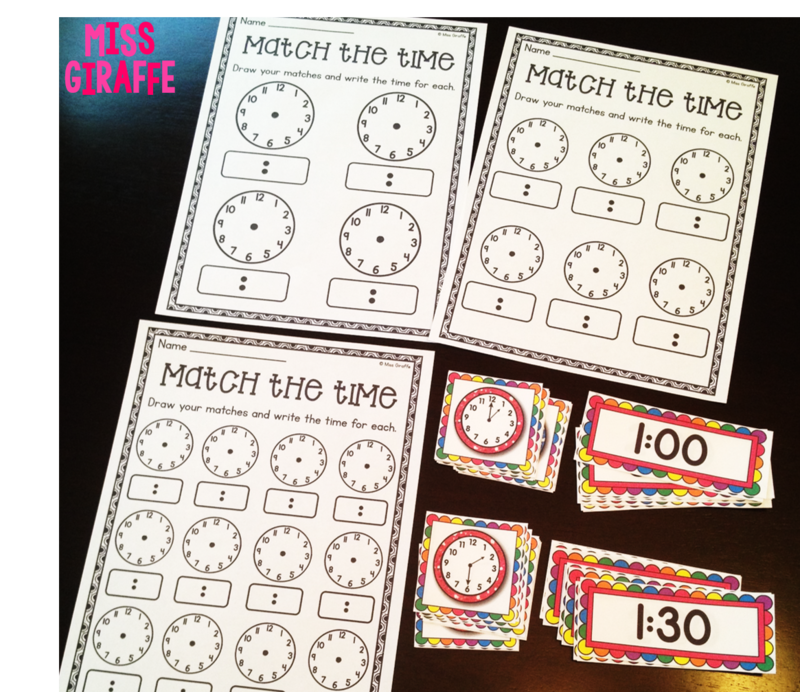 In my opinion, it's one of the easiest math skills for first graders to master and they all desperately want to learn how to tell time so having them already be so motivated definitely helps. It's also great because you don't have to work to make it apply to real life. How many times a day do you answer, "What time is lunch?" or "When is P.E.?" AND, because of that, once you teach it - you can integrate it into your daily conversations really easily because, as a teacher, you're constantly looking at the time or going places based on the time. It's super easy to spot that the clock is on an hour or half-hour and say, "Hey guys. What time is it? Write it in the corner of the paper you're working on." every so often and quickly walk around to see what they wrote. Quick, easy, no instructional time wasted. They just stop for a second to write it and get back to work. Maybe even bust out a bag of pretzels and give a pretzel to each kid for doing it. You may not think a pretzel is a big motivator but, in my experience, a simple pretzel is just as cool as a cupcake if everyone else around you is getting one. "We have recess in an hour. What time will that be at?" Yes, that's elapsed time and blah blah but if recess is involved, they might just figure it out. I think the very first thing you should do is have each student make their own clock. 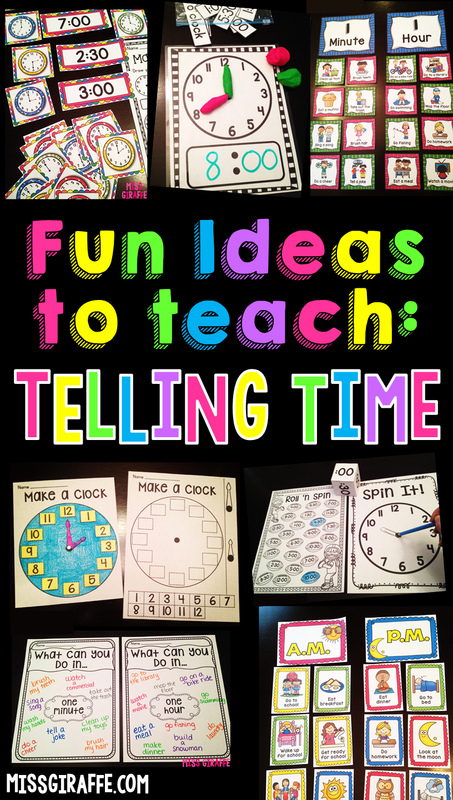 Besides the fact that it is super fun, hands-on, and will get them excited about telling time, it will also help them focus on how a clock looks and works... where the numbers are and what order they go in. They may have looked at a clock a thousand times but not really thought about what direction the hands move. Something about holding the numbers in their hand and putting them in order themselves builds that conceptual understanding. Plus they'll get to feel ownership over their own clock and have one at their seats to manipulate when doing time worksheets and activities. This is a simple cut and paste and everything is there for you on one page. First, they color their clocks and numbers, cut out and glue the numbers in the correct spot, and cut out their hour and minute hands. Then, you use a brass fastener to punch through the black dots on each hand and the black dot on the clock. They can do it themselves but I reeeeally recommend doing it for them so there isn't a big hole that will soon rip and ruin their clock. It's a lot easier to just do it for them than to have them destroy their clock/pieces right then & there OR, even worse, later when you're in the middle of teaching and hear, "*GASP* MY CLOCK BROKE!!!" and have to run to the rescue. For that reason, though, I made a page of extra pieces so that if/when any clocks break or pieces go missing, you'll already have an extra pieces page printed and ready to go and not have to copy extra clock pages for little Billy who spun his clock too roughly or Anna who didn't put enough glue on her number 4 and it's forever disappeared into the classroom floor abyss. For telling time, I think the best thing to do is just practice, practice, practice telling time. 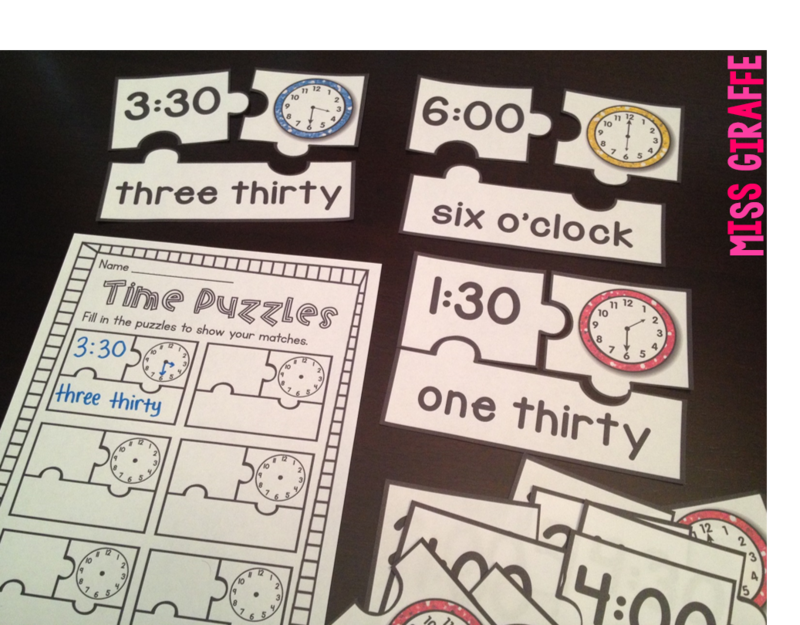 These little clock kids are a fun, simple center. Pick a card, write the time the kid is holding next to the right letter, done. 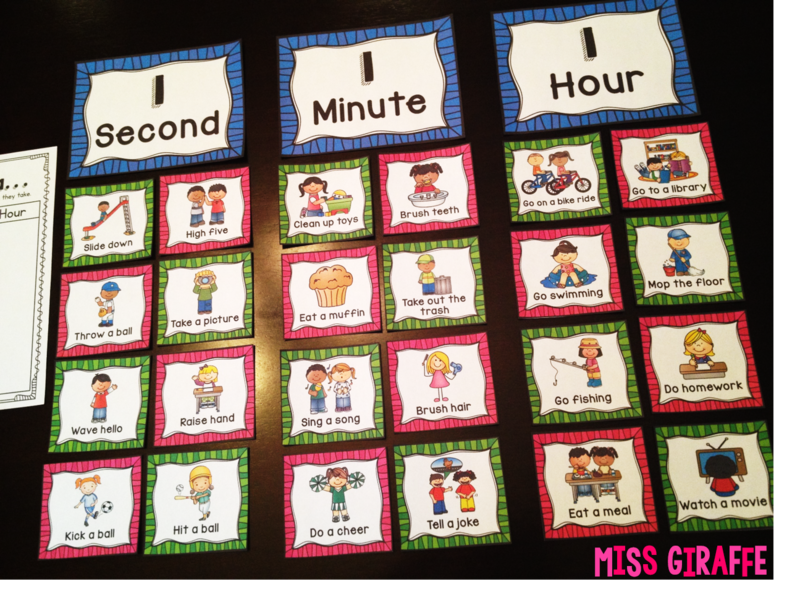 For small groups practice, laminate a clock mat for each student at your table. 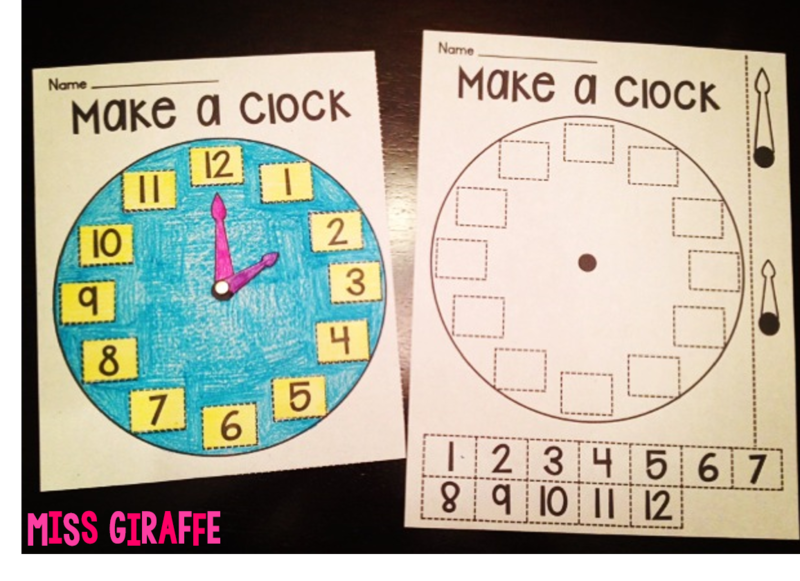 Give them a time (or have them pull time strips from a baggie) and draw it on their clock and also write it below. It's a super simple activity but great practice! I included hour, half hour, and written versions of each so you could make a baggie of just hour times, just half-hour, just written version (three o'clock), or mix them up for a challenge. This could easily be a center as well. If you want to win the best teacher ever award, you could not only let them use the coveted dry erase markers but also use fun colorful dough to build their time on the mat! 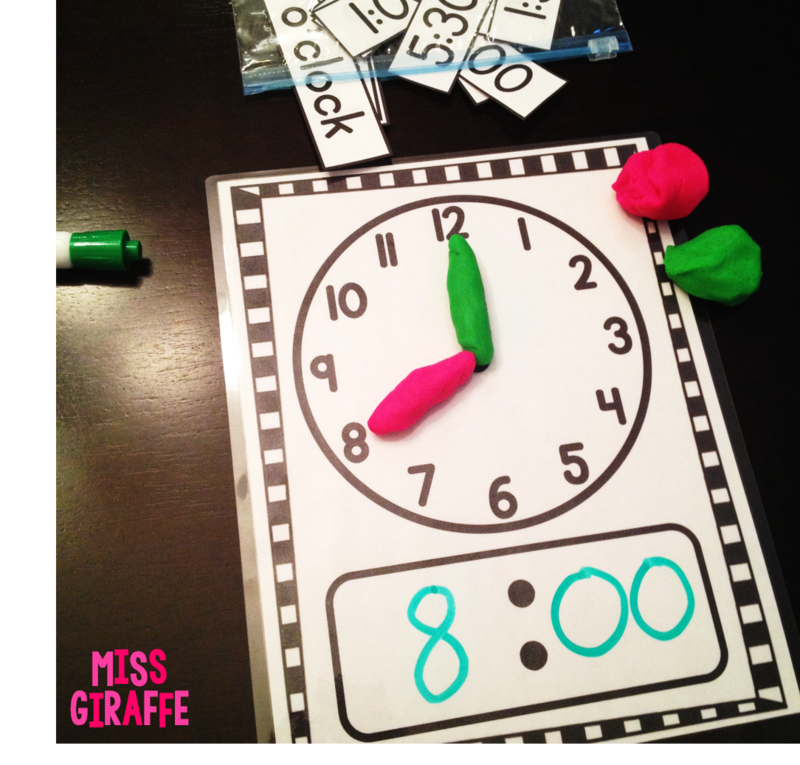 Have students roll their dough into a ball then rub their palms together to make "snakes" that become their hour and minute hands that they move to show the time. I recommend a different color for each. Like I said, this is how you earn best teacher ever points during small group. You can also use the dough to play Race to Noon. 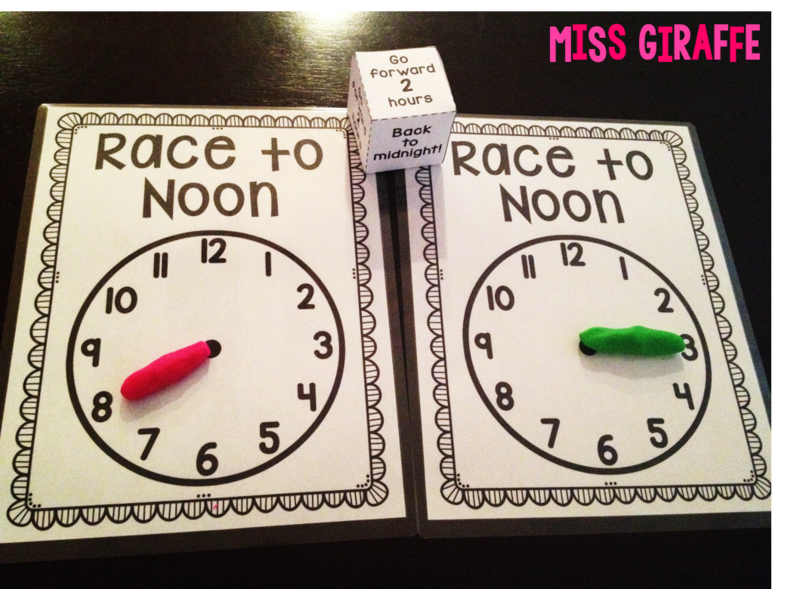 This is a great game to practice telling time to the hour and practicing how the clock moves and vocabulary like midnight/noon. 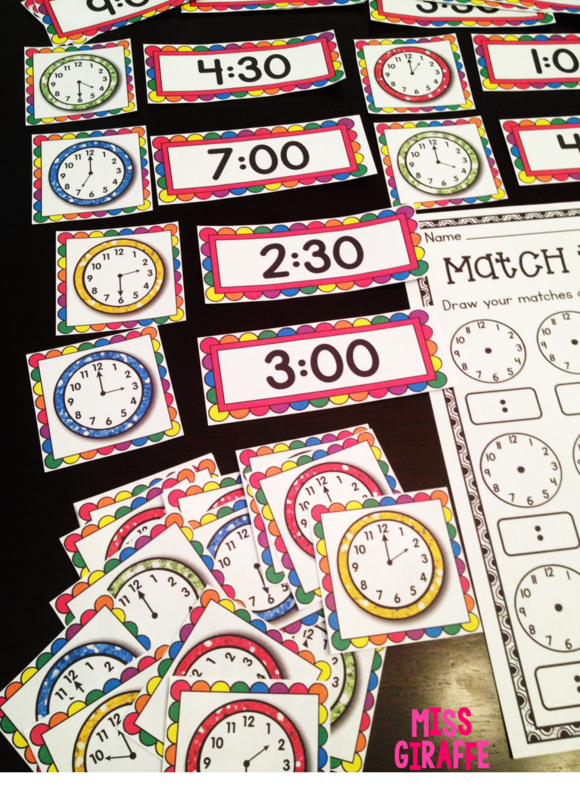 Have students play in partners, each with their own clock mat and color of dough. They both start at "midnight" with their dough hands pointing at the 12 on their mat. They take turns rolling the dice that have them go forward 1 or 2 hours, back 1 hour, all the way back to midnight, etc. The first person to get their dough hand all the way around the clock and back to the 12 (noon) wins! Practice, practice, practice! Here's a quick center I also love. Match the Time! If you know me, you know I like to differentiate everything. I didn't laminate mine. Sorry not sorry :) They held up just fine! So speaking of differentiation (are you sick of that word yet? 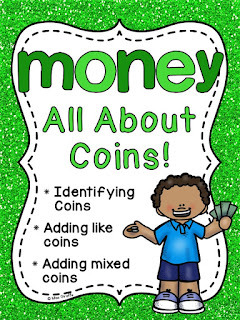 ), if you use my First Grade Math Units, you know that I always provide differentiated worksheets for each concept. 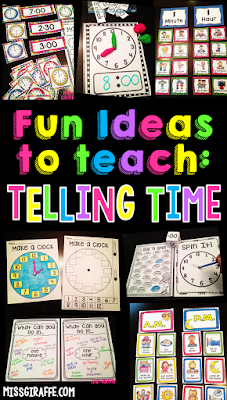 Here are some of the different levels of telling time worksheets. You can always see the level (A, B, or C) in the upper right hand corner inside the star for easy reference. I typically try to make each level conceptually harder/easier but for straightforward telling time, I just included more clocks/less clocks. So one thing I think is so important as you teach time is to teach the CONCEPT OF TIME. Just like a lot of students come to you with little number sense, a lot of students come with a really skewed concept of time. It makes a lot of sense though. How many times have you said or heard someone else say, "Hold on a second" to a child trying to get your attention when you really are asking them to hold on for 5-10 minutes or more? Or any similar situation where the unit of time you say doesn't match how long it takes. If you listen to adults speak to children, it happens A LOT. I've definitely done it! Since children don't really know how long a minute is or how long an hour is, they learn it from experiencing how long those times are when you say them so it's important to be cognizant of using units of time vocabulary incorrectly when speaking to students. In order to practice vocabulary for units of time, I created the "How Long Does It Take?" 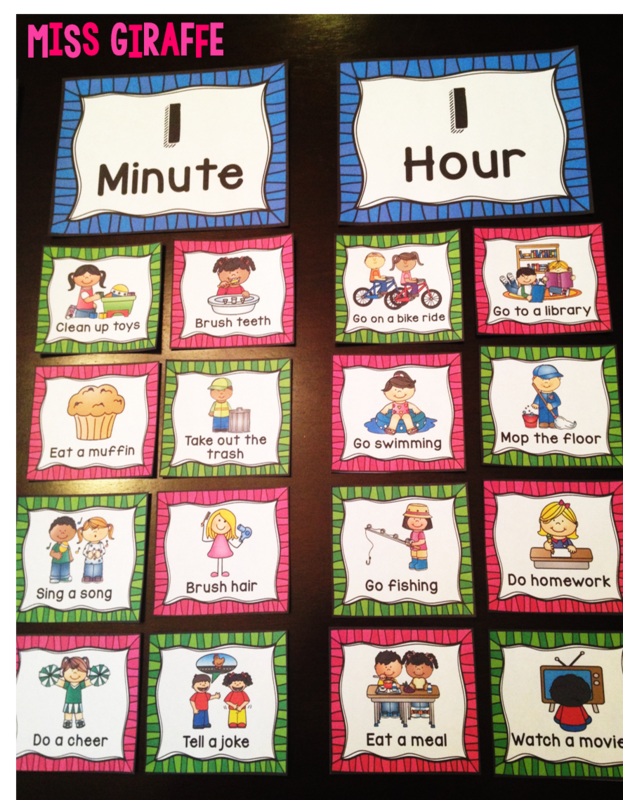 center using common activities that children do or see others doing and sorting them by how long they take. As you can see, students sort the activity by how long they think it usually takes. 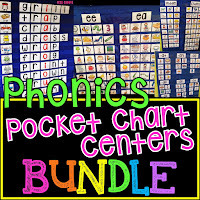 This is one of my favorite centers because you can make it an awesome whole group lesson, especially if you have a large pocket chart. Bring your pocket chart to the front of your students, preferably with them sitting on the carpet or close to you and set out the 3 mats across the top of the pocket chart. Pick 2 or 3 cards to act out as examples and don't be afraid to be a little silly! :) So let's say you grab the card "Brush teeth" - show the class the picture and say, "Hmm how long does it take to brush your teeth?" and let them shout out some guesses. "Does it take a second?" and pretend to brush your teeth really, really fast in one second so they say, "Nooo!"... "Does it take one HOUR?" and brush your teeth super depressingly slow and keep looking at your watch until they stop you with "Nooooo!"s.. "or does it take about a minute?" which hopefully you'll get yes's. Call a kid up to "high five" you in a second (normal high five). Then act out high-five-ing with the student for a minute. Just keep your hands up in the air in a frozen high five with the student - they'll giggle and get it. :) Just try to do a few silly examples like that so they get the idea and then sort the cards together. They can also sort them on their own as a center and write what they sorted on their recording sheet. If they are sorting themselves as a center, it might be better to have them only sort between 2 extremes (minute/hour or second/hour) at first. Another fun whole group lesson you can do to illustrate units of time is just a simple brainstorming of things you can do in a second/minute/hour/etc. You'll be surprised what they come up with! Again, I only recommend doing 1 or 2 at a time. 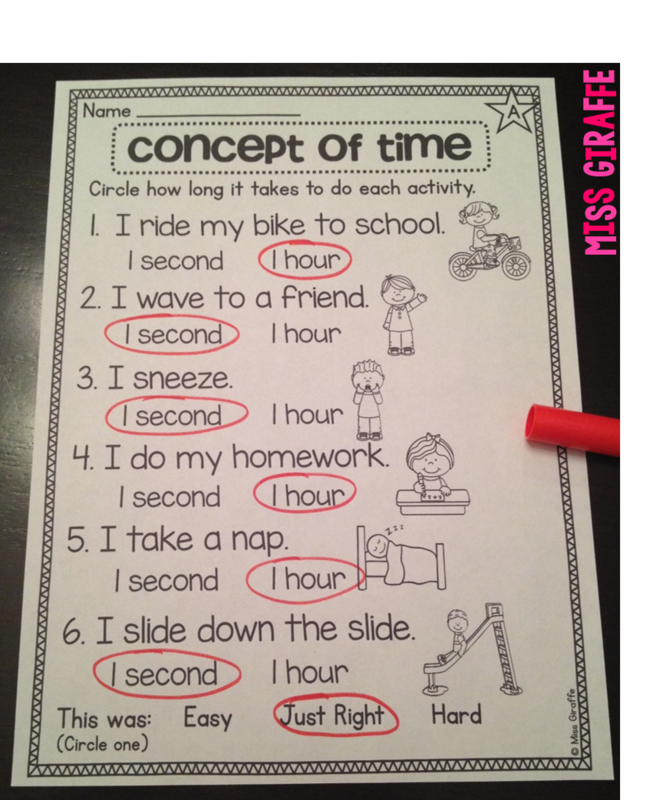 In order to see if they got it, you can have them do a simple worksheet of how long things take. Another concept of time that is important for students to understand is chronological order and how time progresses throughout a day in order to understand schedules. I was trying to think of a fun way for students to practice schedules without using a school schedule. I wanted something exciting so I thought it'd be fun to practice the daily schedule of a zookeeper! I made 12 schedule cards that show what the zookeeper is doing at certain times of the day. As you can see, each card has the time, the activity, and a picture of the activity. 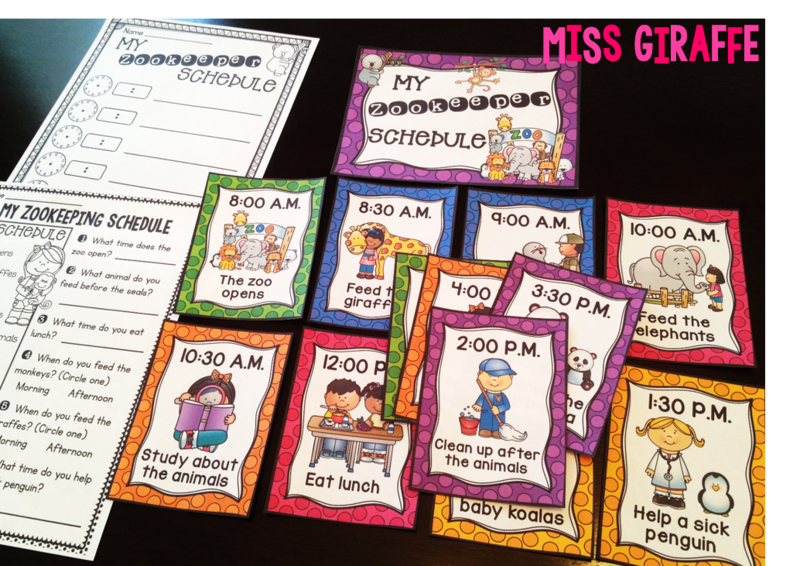 To start out, have your students put the schedule cards IN ORDER. You might be surprised how challenging this can be! I recommend letting them know that "8:00 The zoo opens" is the first card. Since they're so used to 8 being bigger than 1, it might be hard to convince them that 8:00 A.M. is before 1:00 P.M. at first. That's why practice is key! This center is a hands-on way to help them make those connections and understandings. You can also have them use the clock they made to show each time as they set a card down so they can see what time comes next so when they get to noon, they keep going around to the 1. You may even want to try this in small groups first but I think it's really, really important for them to be able to do it on their own too. You can differentiate by only giving them 6 cards to put in order first. Then, once they get that, add the other 6. 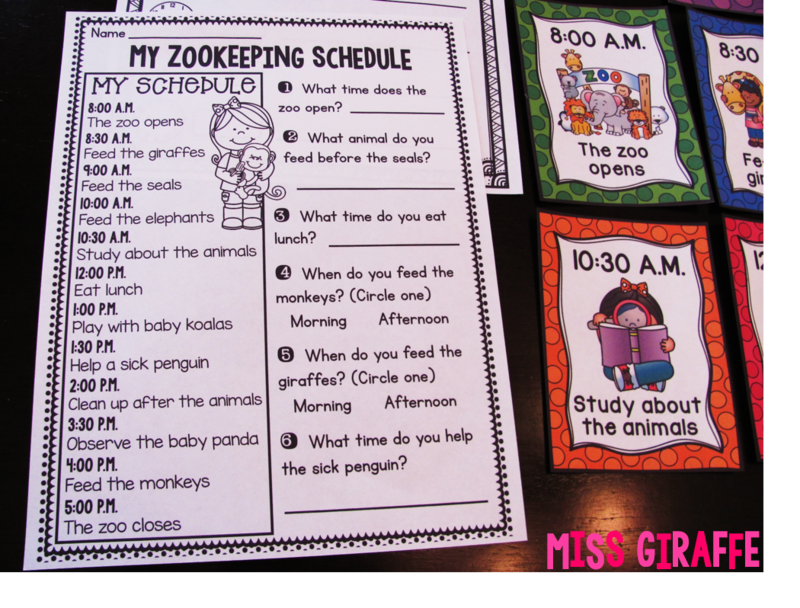 After they sort the cards, have them copy their zookeeper schedule onto the recording sheet (you can see in the top left corner of the picture above). Copy it back to back so it has all 12 times for them to copy, or only make it 1 sided for students only doing 6 times. 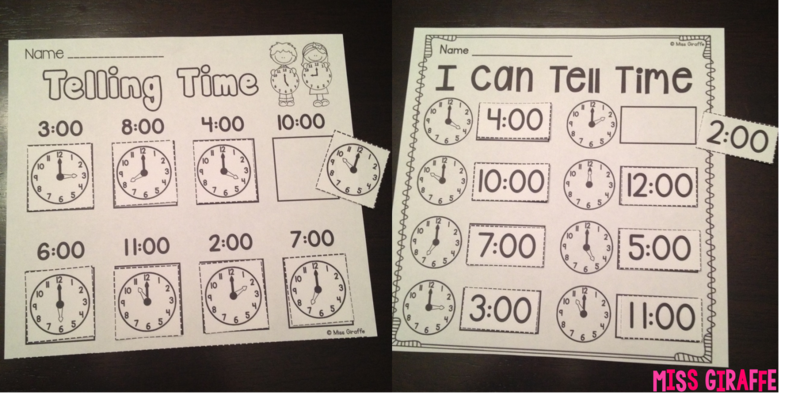 The recording sheet has them draw the time on the clock, write the time, and then write the activity next to them so it is a lot of great practice in one fun little activity! 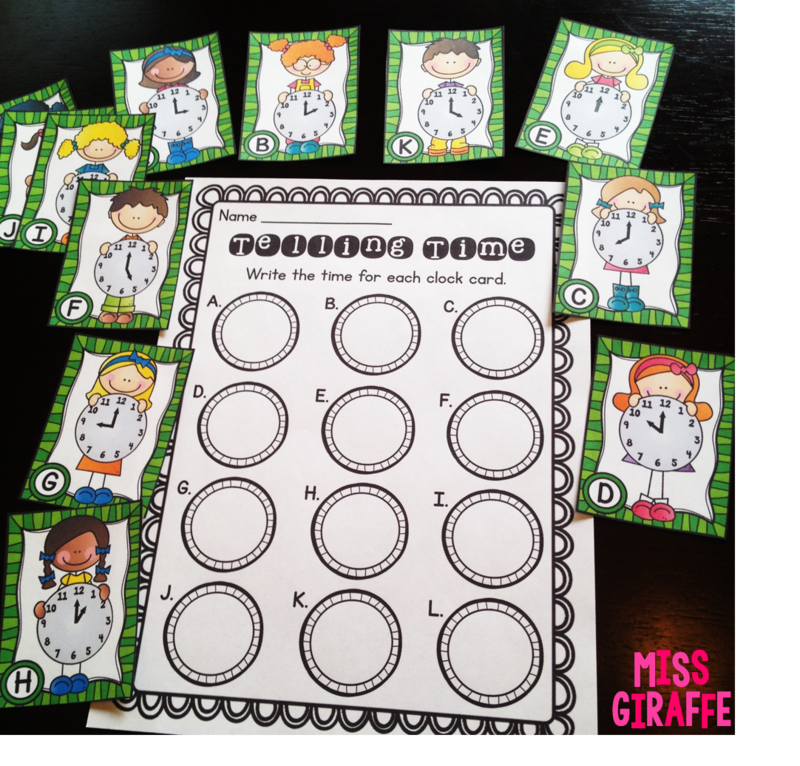 I also made a sheet for fast finishers to do after they complete all of the zookeeper activities for a bit of a challenge. You can also use it as a quick cheat sheet of the schedule for students who didn't finish their books (the slooooow colorers) to use to finish their books or send it home as homework. 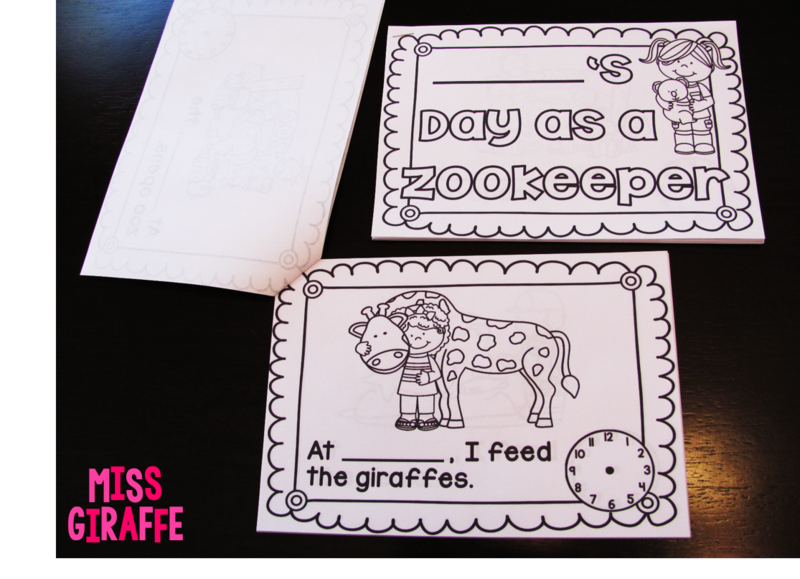 All of the zookeeper fun ended up being my favorite part of our time unit. It was just so much fun! You may have noticed the usage of A.M. and P.M. in the activity above... 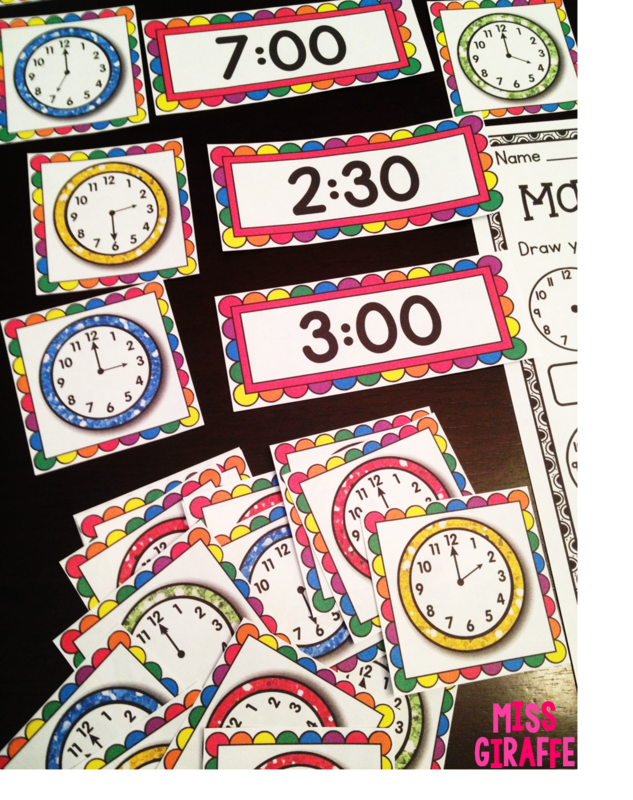 I think it's important for students to understand that there are two 8 o'clocks in a day, the clock hands land there twice a day and one is called A.M. and one is called P.M.
To help illustrate this (I love using pictures for everything! ), I created a simple A.M. vs. P.M. sorting activity. 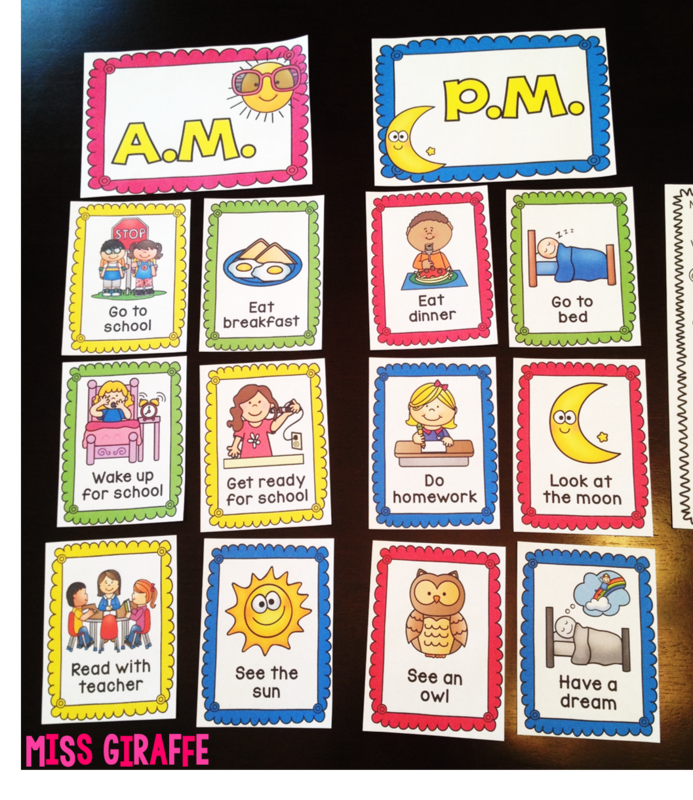 For this activity, students sort when these activities are usually done. Having them connect A.M. and P.M. with things they actually experience (waking up for school, eating dinner, etc.) will help them understand. This game is a lot of fun! 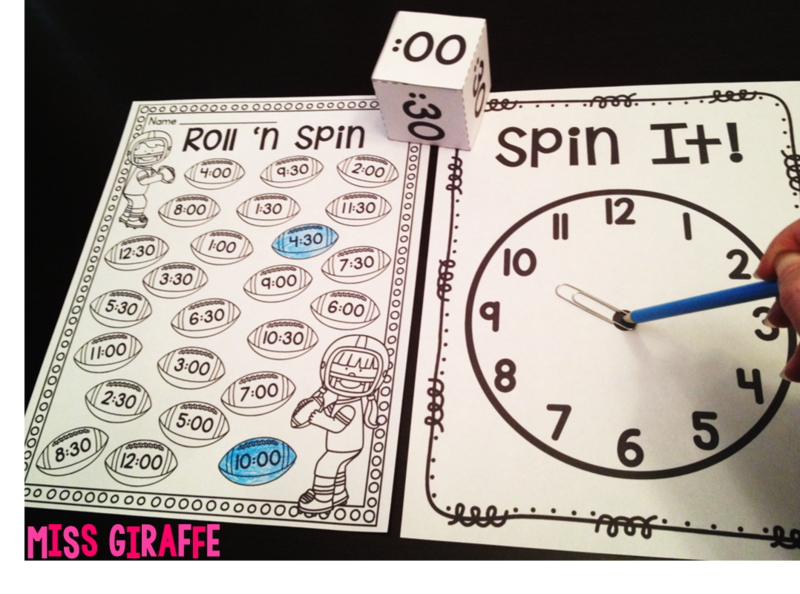 Students spin the spinner to get the hour and roll the dice to get the minutes! I just included :00 and :30 for the minutes since this unit is all about hour and half-hour. So if they spin a 4 and roll a :30, they made 4:30! So they find 4:30 on their game mat and color it in. - Independently: Student plays by themselves until they've colored all of the numbers or until math stations time is over. - With a partner: Partners share a football game mat and each have a different color crayon/colored pencil. They take turn spinning/rolling and color in the football in their color. If that time is already taken, they don't color in anything. When all the footballs are colored, the person with the most footballs wins! This is one of those fun games that students can play over and over for a whole lot of practice and won't get sick of! 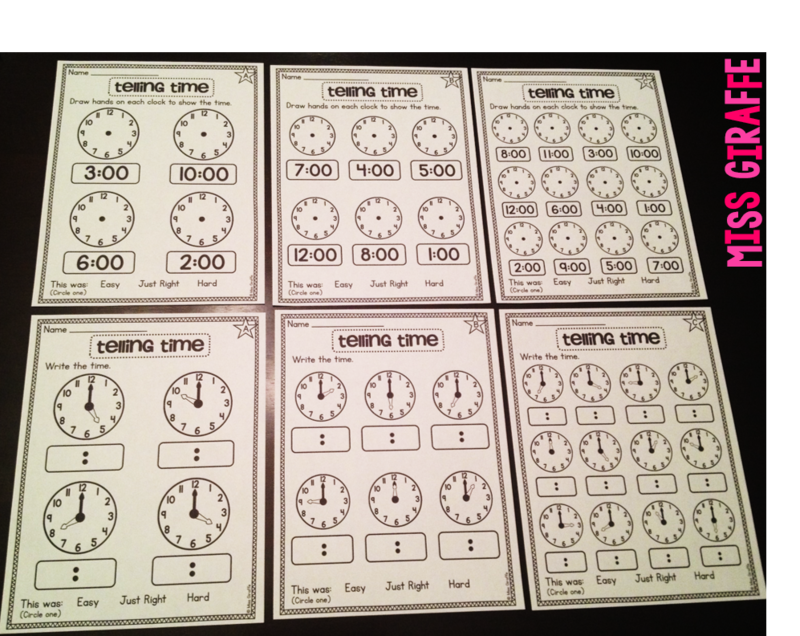 I also made a telling time to the hour only version of this game called "Spinnin' Time" where you don't use the :00/:30 dice. Students simply spin the spinner to find the hour and color in the correct football. All the footballs only have times to the hour (3:00, 4:00, etc.). And this wouldn't be one of my units without some cut and paste fun!! I want to show you more from this pack but this blog post is already so long!!! But I hope you enjoyed all of the activities I shared and can use some of them! I'm so excited to be a third of the way done with my second half of first grade math units. 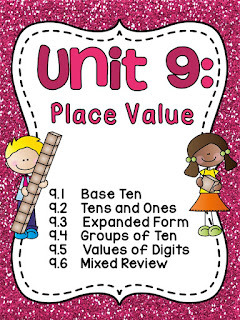 You can grab them all at a super deep discount in the First Grade Math Units 10-18 Bundle! 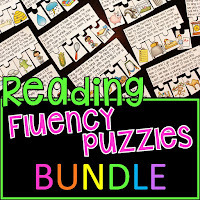 If you loved the First Grade Math Units 1-9 Bundle, you'll definitely love this huge bundle too! I'd love to hear from you in the comments!! Just fantastic! 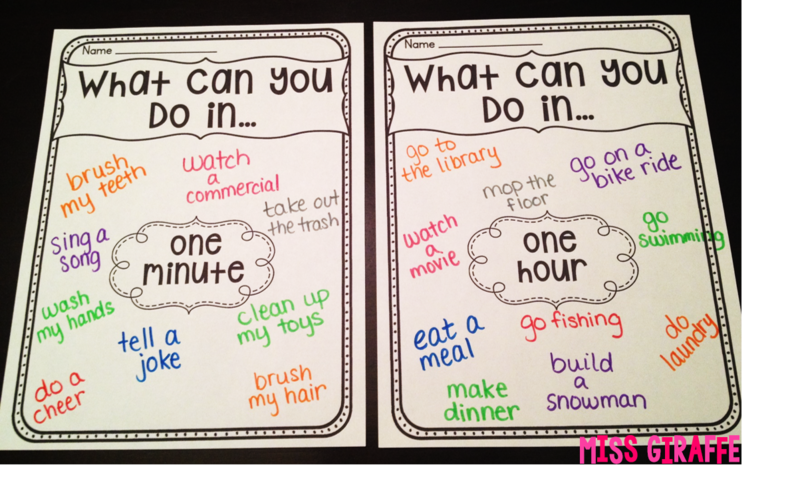 Love all these time activities! Added to my wish list! I love all your products!! 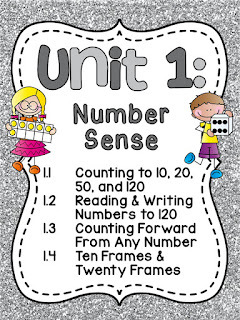 I've not bought any math units yet but they're seriously high up there on my wish list! I know your super busy being a creative genius but when you've created the math units would you ever consider bundling the center activities only? 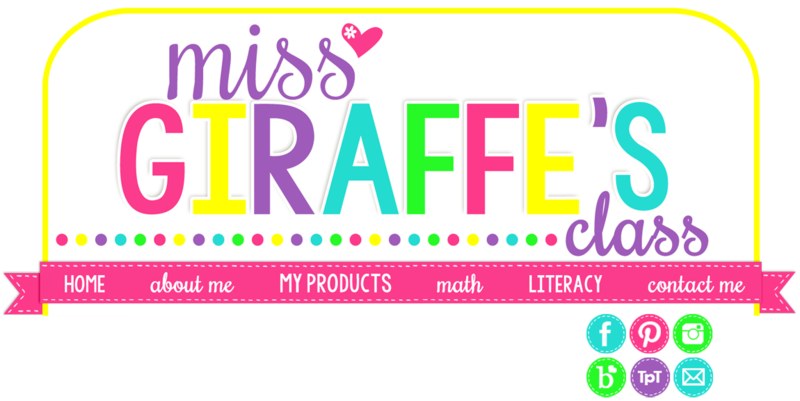 I have a math curriculum that I'm required to use but I do a lot of supplementing with center activities so I can work with groups - I'd definitely buy all your centers! We're doing time soon so I might just go for it and buy this one! You made me excited for teaching it!! Your ideas are awesome! I try very hard to teach with hands-on activities (thankfully my principal has given us permission to use our math program as loosely as we'd like and supplement as much as we'd like). I love all of your telling time ideas. These are exactly the type of lessons I like to use. Why can't there be a math curriculum that's as much fun as this?!! These are such amazing ideas. Time is a difficult concept to teach. Thanks for sharing. Love this! Do you sell the activities individually? I already have similar activities of some but love others! Specifically the jig saw one, the race to noon, and the matching one. I have matching ones but yours are cuter! This post was sooo inspiring! Thank you for sharing your great ideas. Hi Ms. 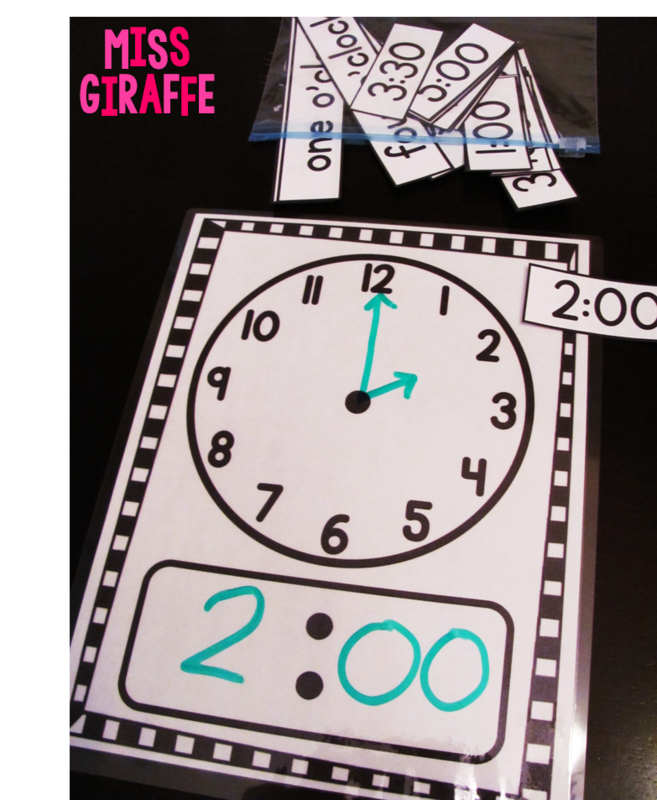 Giraffe I really like the idea of using daily conversations to teach time. I really like the pretzel incentive you use to get students to write the time at the top of their paper. These are great ideas I will use in my future classroom. Thank you!